As you all know I love a good horror story, and it doesn’t need to be all death and destruction. What I’ve found with Mark Cassell and the world of the Shadow Fabric that he has created is a thrill ride which just hits the spot. When I found out he was releasing a new novella set in the same world, I couldn’t resist. If you haven’t read any of Mark’s works before, why the hell not? In all seriousness if you like horror with an edge then stop on by his site, The Shadow Fabric, and check out his writings. But don’t worry about reading his stories in sequence, Hell Cat of the Holt is a delicious dip into the world he has created, though you may not quite look at shadows in the same way again. Hell Cat of the Holt takes us on a journey with Anne, suffering from a family loss and then the disappearance of her cat, who finds that the village that once held happy memories now provides her with a glimpse into a world she doesn’t quite understand. A local legend concerning sightings of a Hell Cat and the ramblings of a neighbour lead Anne down a road where she finds that there is no easy escape from the Shadow Fabric once it has you in its sights. Mark’s writing is so good that it was very easy to slip back into his world, like putting on a old shadowy blanket, a bit grubby but oh so comfy. He handles the slightly more gruesome sections of the tale with a skill and ease of which I am slightly jealous. The pace has you trying to catch your breath as you turn each page waiting to see what others horrors will befall the main characters. To be honest it only took me a couple of days to read this and that was only because my children needed to be fed and I needed to sleep. This is certainly a cracking read and will appeal to anyone who reads horror and the supernatural. It will turn your ideas of demons and witchcraft on its head, in a good way. As she treads an unsteady path between folklore and fact, her confidence in where she grew up begins to crumble. Into hell. 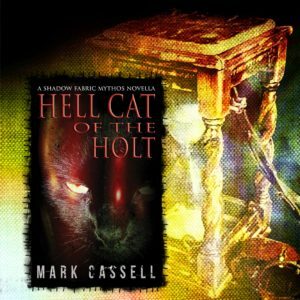 Set in the bestselling Shadow Fabric mythos, Hell Cat of the Holt is not just a ghost story, and is much more than a black cat sighting. What a lovely review. Thanks so much! Glad you enjoyed it.